Here you will find a mix of what matters: something that may make you laugh, cry, fume, or simply shake your head. Whatever you do, I hope it makes you think. A delicious piece of prime steak is a meat eater’s delight: add the right wine, and you’ll place him in gastronomic heaven. I’m no vegetarian, but too much meat gives me little pleasure. That’s why I feel overly lethargic after the Thanksgiving and Christmas holidays. I tend to get bloated from overeating ham and turkey, and my body screams for green vegetables. I dare not resist because there is a hefty price to pay. The weight of extra calories is cumbersome and not a sight for sore eyes. Moreover, I believe that too much protein wreaks havoc on my digestive system and causes “tectonic plates to shift in my stomach” creating weird sounds and emissions from my body that I do not welcome. Some will say broccoli and cabbage have the same effect. However, I believe that they do less damage than meat because they don’t have the excess bulk that meat has. Well, the difference is based on the discomfort of the eater! My father is the reason for my meat aversion. During my childhood, Papa planted all kinds of vegetables around our home and made them a staple in almost every meal. He used meat sparingly, mostly to flavor a dish or as a filler. Therefore, I acquired a taste especially for legumes (which were his favorite vegetable). I enjoyed fish and occasionally ate our home-raised chicken. However, I avoided red meat. Like my father, I am squeamish about poultry. I have no stomach for fried chicken skin regardless of how crispy it may be. I also think twice about ordering eggs at a restaurant although I like a good omelet filled with spinach and cheese. I confess too that I enjoy scrambled eggs with grits and a sliver of bacon on the side. Now my bacon has to be crisp and slightly burned. I wouldn’t request dry scrambled eggs or a hard omelet. However, you can guess I don’t like my eggs runny. That brings me to the point of sunny side up eggs. Somebody said that beauty is in the eye of the beholder, but I think that the adage applies more to sunny side up eggs. I presume that “sunny” refers to the brightness or lack of it in the yolk of the cooked egg. Sunny side up eggs are eggs fried on one side until the white is barely set and the yolk remains liquid in the middle. To the sunny side up fan, a runny yolk may appear more inviting and shinier than a more viscous yolk, but to my dad and I, a charred yolk is the sunniest treat in a fried egg. There is also a slight variation of this dish: the difference is that the egg is lightly fried on both sides with the yellow still runny. The latter is called easy over eggs. 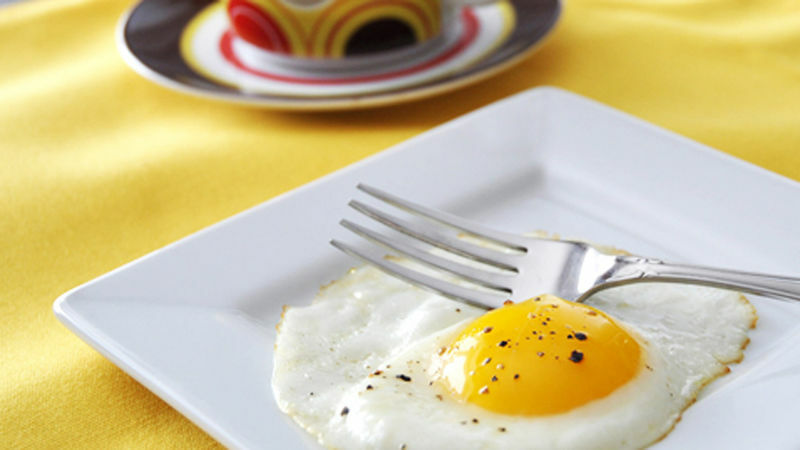 Because the egg is fried quickly on both sides, the yolk may vary in runniness and even luster. Whether you are talking about omelets, scrambled, poached, boiled, easy over or sunny side up eggs; diet plays a role in what the beholder sees. According to Dr. Anne Marie Hellmenstine, the color of egg yolks can vary from pale yellow to bright orange depending on the diet of chickens and other poultry. She notes that although color variation occurs naturally in eggs, farmers can control yolk pigmentation by regulating the number of carotenoids they feed to chickens. Carotenoids are natural pigments that are found in foods like carrots, sweet potatoes, and cantaloupes. Natural pigment additives like marigold in poultry feed enhance yolk color because artificial sources are generally prohibited. However, Dr. Hellmenstine notes that certain commercial pigment enhancers, namely Lucantin (R) red and Lucantin (R) yellow are allowed on the market to affect the coloration of egg yolk. The color is not an indication of nutritional value although some people swear that the brighter the yolk, the better the egg. A study published in the “Journal of Nutrition” found that consuming cooked eggs as opposed to raw eggs provided the highest rate of protein absorption and is the safest method of consumption. The study concluded that the body absorbs protein from a cooked egg at a rate of 91 percent, while raw egg protein is absorbed at a rate of 50 percent over a 24-hour period. The culinary benefits of eggs, however, outweigh the risks of getting foodborne diseases from them, if they are safely handled and prepared. But the LORD said unto Samuel, Look not on his countenance, or on the height of his stature; because I have refused him: for the LORD seeth not as man seeth; for man looketh on the outward appearance, but the LORD looketh on the heart (1 Samuel 16:7, KJV).